Ever notice how old clothes often reflect trends from the even more distant past? Take dresses from the 1980’s, for example. Many of them are basically replaying the greatest hits of the 1890’s, 1920’s, 1940’s, and 1950’s, albeit with the addition of synthetic lace, crazy fabric, and chronic shoulder pads! 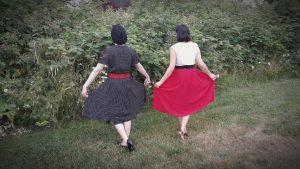 Believe it or not, this is great news for those of us who love vintage fashion, are too broke to buy everything we want, AND are too lazy to make our own retro clothing from scratch! Just check out this dress from our “Vintage a la Thrift Store-1920’s” article (found here)! This thrifted dress has a waist line from the 1920’s but fabric from the 1980’s! Sometimes, these dresses just need the right accessories to help them shed their 80’s aura. Others need a little more help, and by “help” I mean some DIY alterations! I got the 1980’s-dress-bug hard when I found this gem at Goodwill. First things first- remove that overtly sweetsie lace detail!! I used my thread ripper to pluck out the stitches holding the lace in place. Unfortunately, the collar and lace were sewn into the shoulder seams and front button placket… I had to open those seems up a bit to remove the lace, then re-stitch them closed. I probably could have avoided this fun process had I foreseen my eventual modification of the collar, but stay tuned for that. Next, we must move on to other distasteful features, such as those shoulder pads and sleeves! The pads had to GO!!! Next, gotta shorten those sleeves! I tried on the dress and used tailor’s chalk to mark the length I thought the new short sleeves should be. I turned the dress inside out and marked this on the sleeve (the pen in the picture shows where my marks were). Next, I made markings about 2 inches longer than my desired length. This created my seam allowance and is shown in the picture by the scissors. I then cut off the sleeve at this point. The pins in the picture were used to keep that darn slippery fabric from moving around when it was cut! I used the cut sleeve as the template for cutting the other sleeve off. I folded the dress in half so that the cut sleeve lined up with the uncut sleeve. After the necessary pinning and marking, I cut the second sleeve to match. I tried on the dress and found that the sleeves were still a bit too long, even with the needed seam allowance. I went through the trimming process again. After trying the dress on one more time, I was ready to hem and haw! Er, I mean I was ready to hem the sleeves! To keep that crazy fabric from raveling, I dabbed a bit of Fray Check on the cut edges. Dress inside out, I made markings where I wanted the final length of the sleeves to be, about an inch and a half from the cut edges of the sleeves . I brought the cut edge to meet that marking, making a fold. I then folded the folded bit over on itself to make a rolled hem for the sleeve. I used a ton of pins to hold that in place. At this point, I would have been finished were it not for that collar. Still too big! That super high neckline was a bit tight and fussy too! To minimize the problem, I folded under the curved edges of the collar to make straight edges. I also folded the edges of the front neckline under to create a v-neck. (I removed the top button before folding.) All of this was pinned before being stitched in place by hand. The white paper in the picture helps the modifications be seen in the picture. And after much ado, that’s how we got short sleeves with a coordinating neckline and collar! Hurrah! 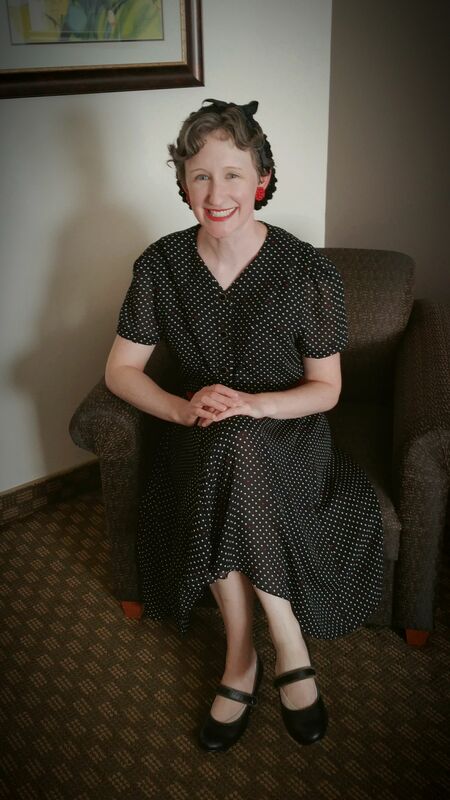 We only needed period-appropriate accessories and makeup to take this dress back in time! Luckily, I not only had the necessary thrifted accessories, but I also had the help of a hot photographer (my hubby) and my fabulous friend, Katherine! 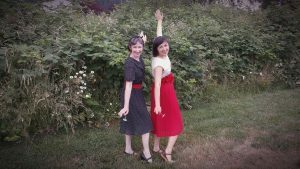 Together, we forayed into a funny, fantastic, forties fashion shoot! Say “cheese”! 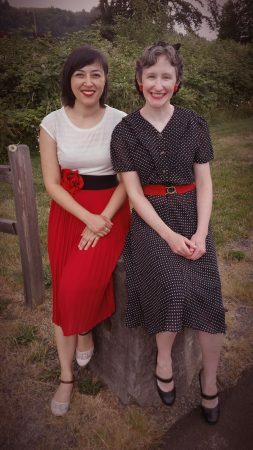 Both my dress and Katherine’s outfit are not vintage but have lots of 1940’s flair! The only vintage items are my belt and earrings! The “snood” hair net that I’m wearing was actually a DIY that will be featured in next week’s post! These 1940’s fashions made us want to dance! We can’t wait for more fabulous 1940’s fun! Stay tuned! I just found your blog from a photo on Pinterest. I love it! I am crazy about Goodwill and remaking 80’s clothes into something wearable. You did a fabulous job on this one! I also read the post where you used your knitting round to make a snood. I was sitting there in stunned admiration. My grandma has tried to teach me to crochet, to no avail. The thought that I could make one with the knitting round my son got me for Christmas (and haven’t used) is electrifying to say the least. I will definitely be reading back through your posts! I also have have a blog and love to wear vintage clothing. Maybe you could pop by sometime ;). Hooray!!! 😀 So good to meet a fellow Goodwill shopper! Glad you enjoyed the projects! I can’t crochet either, so I was super grateful to find the round looms. Speaking of electrifying ideas, I had NO idea that one could spray paint silverware?! 😉 I look forward to reading about more of your fabulous ideas! Thanks so much for commenting!! Blessings!